Who Should Take This Certification Programme? With a surge in access and exploitation of healthcare, resources have become more confined, and prioritization in healthcare has become inevitable. Health Economics and Outcomes Research (HEOR) is a discipline, which complements conventional clinical development data to guide decision makers regarding patient access services. It establishes efficacy of the product or service, compares its effectiveness to other interventions and considers its incremental cost efficiency. HEOR is an increasingly important domain, as rising healthcare costs continue to challenge the global economy and despite evidence that additional spending is not associated with increased value in outcomes, costs or quality. No matter whether you are a student or a graduate, exploring to tackle a thriving career in an industry or a multi-national pharma enterprise, this certification programme is your preliminary requisite to enhance your knowledge and skills in the field of HEOR. The students, academicians, professionals and administrators from pharmaceutical industries, hospitals, insurance companies, government and academic institutions. Pharmacy graduates/post graduates who are planning to undergo higher studies in the field of HEOR. Individuals working in public health, health policy and government or regulatory positions. Market access professionals looking to gain an understanding of the HEOR landscape and process. Management professionals working in health plans, hospitals and other facilities, and healthcare provider organizations. Pharmaceutical, biotechnology and device industry professionals working in outcomes research, product reimbursement, medical communications, new product development, biostatistics, regulatory and medical science liaison field operations. Individuals with undergraduate degrees in public policy, economics, applied math/engineering or a healthcare field who are considering a clinical or management career in health care. Human resources professionals, brokers, benefits consultants, chief financial officers and others involved in purchasing and evaluating health benefits on behalf of employed populations. How To Get This Certification Done? Sign up by providing your credentials and confirm your account on the mail received from MAHS. Go to the courses to select “Certification Programme in Fundamentals of HEOR” and make the payment from your debit/credit card or PayPal account to enroll yourself. Though I had an undergraduate Degree in Economics and have been working in the Healthcare Industry for last 5 years, I had strong feeling of hitting a plateau, as I was simply not aware of the appropriate tools facilitating the use of Economics in Health. At this juncture, I came across this certification on HEOR . The cost of the program was also affordable, which was encouraging. 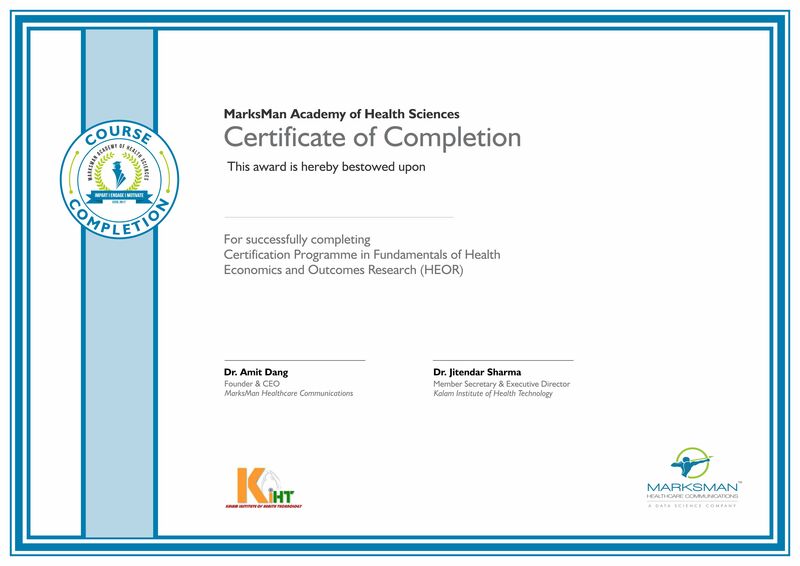 Going through it, while I could fully relate to my existing basic knowledge and experience, the certification gave me new understandings from the healthcare perspective, on healthcare related economic concepts & models, HTA, PROs, Clinical Trials and Health related Analysis. For me, this certification has given the required “Lift” I was needing. I have already recommended this certification to some of my colleagues who are Health Administrators. I found the course interesting, challenging, and rewarding. A lot of subject matters relates directly to my area of work, so it is helping me to understand it a lot more. I enjoy working in my own time, being able to take my time.